ZIZ News– US Airways has added a second weekly flight into St. Kitts’ Robert L. Bradshaw International Airport. US Airways which operates a scheduled service from Charlotte-North Carolina on Saturdays has introduced a second flight on Sundays. General Manager of TDC Airlines, Elroy Lewis confirmed to the communications unit in the office of the prime minister, that the Sunday US Airways flight to St. Kitts has been introduced for the month of March with the possibility of its continuation. Lewis said the second flight on Sundays has been introduced due to increased passenger bookings to St. Kitts during March. 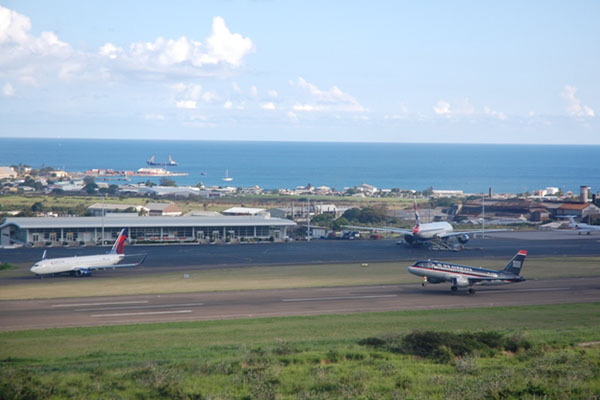 US Airways is one of three American carriers – Delta Air, American Airlines and US Airways — that operate scheduled passenger service into St. Kitts’ Robert L. Bradshaw Airport. The additional US Airways flight brings to 14 the number of flights weekly into St. Kitts from the United States.